GAME 2 - 2010 Stanley Cup GAME DAY: Ottawa Senators (1) @ Pittsburgh Penguins (0), Friday Apr. 16, 2010 - 7:00PM EST. Ottawa (Lead series 1-0) visit the Mellon Arena to face Pittsburgh (Trail series 0-1) for game two of their round 1 best of seven series Friday night. Ottawa gets the first win of the series in a nail biting 5-4 final. This game was not as close as the score might indicate. Ottawa held 2 goal leads for large parts of this game and didn't appear to let off the gas protecting the lead. Any time the Pens got it within one the Sens would answer back except of course after the 4th goal by Pittsburgh which came in the last couple minutes of game 1. 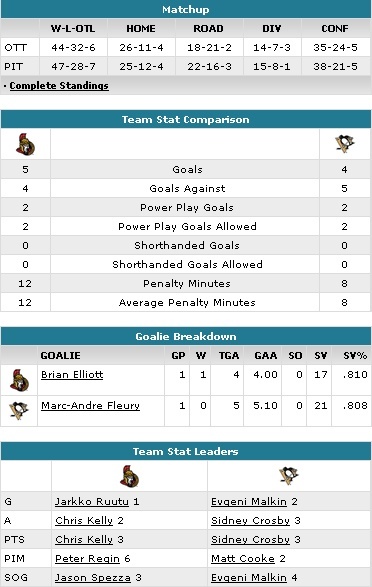 Fleury was down right awful at times while Elliott was solid but not spectacular. There was some luck for both sides. Kelly's goal off of a weird deflection from a dump in and of course Malkin's second goal which came off of the inside of Chris Phillips' knee. Both teams excelled on the Power Play and if the Sens hope to have any chance of heading back to SBP up 2-0 they'll need to be better on the PK and do a better job taking away Malkin's time and space. Another key will be to get more out of the Sens top line. In a 5-4 win they factored in on just the game tying goal. Ottawa will look to go up 2-0 Friday night for the second game of this series. Look for a much more focused and hungry game from the Penguins. I don't expect to see them come out flat again. Ottawa just needs to attempt to match that intensity and hope to get out of the first period tied or maybe down by 1 goal. Fire as much rubber at Fleury as possible because if he lets another softy in it may start to affect him. Elliott will need to be NHL 1st star of the week calibre at times in this game if they hope to win. Both teams will be better and more prepared so game two sets up to be even more exciting. Milan Michalek (Left game 1, did not return??) ... I hope it's just "bumps and bruises"
DirtyDave wrote: Milan Michalek (Left game 1, did not return??) ... I hope it's just "bumps and bruises"
If they were up by two goals at the time then I could see them leaving him out for precautionary reasons. No doubt if he plays in game two that he's still hurting somewhere though. We won't know until the off season I'm sure. how about the Sens relentless pressure.. even when they were up by two they were pressuring the Pens and checking them like crazy. I love it. i think if the Sens played like this they may have won the stanley cup. Ottawa dominated at times for sure. I think there's plenty of room for improvement though and they'll have to be better because the Pens certainly will be coming at them hard on Friday. A goal like Kelly's probably won't happen again and Ruutu's game winner is not too likely either unless Fleury continues to struggle in net. Cap'n Clutch wrote: Ottawa dominated at times for sure. I think there's plenty of room for improvement though and they'll have to be better because the Pens certainly will be coming at them hard on Friday. A goal like Kelly's probably won't happen again and Ruutu's game winner is not too likely either unless Fleury continues to struggle in net. True. the tone early on tomorrow is really going to determine where the series goes, IMO. I just watched the highlights, Elliott wasn't horrible. he was screen on all shots but the back hand, which seemed like a knuckler. And don't forget Neil's goal -- if Fleury hugs the post like they teach in Goaltending 101 that's not a goal. Fleury was not good last night. Neither was Elliott, really. Neither was the Sens PK, frankly. I don't expect Malkin to get any more chances -- someone has to put that mother on his a$$, and it can't be a little guy like Karlsson or a lightweight hitter like Spezza. Sutton and Carkner had better settle down and not *try* to hit everyone. Take the chance when it presents itself, but don't go our of your way -- kind of like forcing passes through blocked lanes, it usually doesn't work. Alfie has to wake up from his daze. Spezza has to continue doing what he's doing and hope for some better line matching as this series progresses. I think it is an absolute travesty of justice that Matt Cooke has just 2 minutes of penalties, and that was when he suckered Spezza to take a matching minor. Spezza has got to be smarter next time. Talbot is a disgrace for those dives -- this is the playoffs, for crying out loud! The refs should get a bit of a lecture -- when it's announced like that on Coach's Corner you know *someone* will say something; I just don't know if it will make a difference. Sutton needs to play bigger... last night he seemed to be hesitant to make a big hit... was he worried about a penalty? Maybe just getting a feel for the series... we'll see on Friday night. But he needs to wallop the crap out of someone in Game 2 and set the tone with big hits. Sure, learning and doing things in a game is completely different. I can imagine with all the pressure Fleury was getting from the Sens he probably forgot to hug the post as much as he should. That's part of the game, what you say is Fleurys error I say was due to the ferocity of Neil's line. shabbs wrote: Sutton needs to play bigger... last night he seemed to be hesitant to make a big hit... was he worried about a penalty? Maybe just getting a feel for the series... we'll see on Friday night. But he needs to wallop the crap out of someone in Game 2 and set the tone with big hits. Probably doesn't want to get beat. If he gets beat by someone on this team it's more than likely going to be a goal. But I noticed that too... I'm not terribly upset with him being a bit more careful. Elliott will need to be better though... hopefully the Game 1 jitters are all cleared out. First playoff game ever for the kid... he did great all things considered. 16 Re: GAME 2 - 2010 Stanley Cup GAME DAY: Ottawa Senators @ Pittsburgh Penguins, Friday Apr. 16, 2010 - 7:00PM EST.